Honolulu International Airport (HNL) on Oahu is Hawaii's major airport, serving as the entry point for most of Hawaii's visitors, located about six miles from downtown Honolulu. All twenty-three major domestic carriers and sixteen international carriers serve Oahu, so you can get here from just about anywhere. Rental cars, taxis, and shuttles are available at the airport. A local bus line also offers service between the airport and Honolulu; the bus is inexpensive and convenient, but has no special luggage holders so you have to carry your luggage on your lap. There are also direct flights from the mainland to Maui, Kauai, and Hawaii's Big Island, but for the most part, you may need to connect through Oahu to get to the neighbor islands. Finding accommodations is easy in Waikiki. You'll find everything here from historic hotels and boutiques, timeshare, rental condos, and luxury resorts. You'll find more than 30,000 hotel rooms on Oahu alone. Anytime of year is a good time to visit Hawaii. Summer, between April and November, is warmer and drier (average temperature is 75°-88° F) while winter, between December and March, is a bit cooler (68°-80° F). Trade winds keep things comfortable year-round. 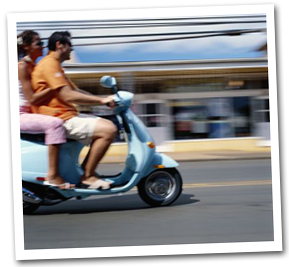 If you are planning on spending most of your time in Waikiki, you really don't need to rent a car. We suggest taking a shuttle or cab ride from the airport to your hotel. The beach, activities, restaurants and attractions are all within walking distance, or a short trolley ride. You'll save money on parking your rental car in Waikiki, and when you are ready to take a trip out of Waikiki, car rental agencies are in the area to help you with your transportation needs. Although many visitors to Oahu rent cars, the island's bus system, provided by Oahu Transit Services, offers an inexpensive and convenient transportation alternative. 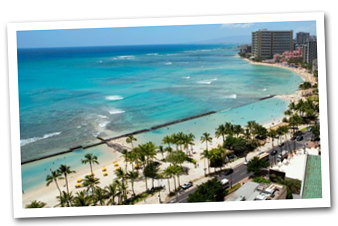 Honolulu in particular has an efficient public transportation system, and many buses and historical trolleys run between the resort area of Waikiki and outlying island attractions. 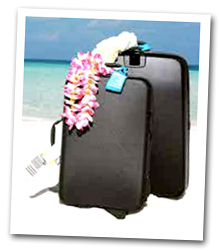 To really experience all that Oahu offers, the North Shore, Pearl Harbor, Chinatown, consider renting a car. Many visitors also enjoy taking bus tours to conveniently explore the Islands. Shuttles, taxis, and public transport are available on most islands. To get around, we have three major freeways, connecting you to all points of the islands. And just so you know, going east is called Diamond Head direction; west is Ewa direction; Mauka is toward the mountain; and Makai is toward the ocean. Oahu is on Hawaiian Standard Time, two hours earlier than the West Coast (Pacific Standard Time) and five hours earlier than the East Coast (Eastern Standard Time). Unlike the rest of the U.S., the Hawaiian Islands do not observe Daylight Savings Time. That means that during the summer months, Oahu is three hours earlier than Pacific Daylight Time and six hours earlier than Eastern Daylight Time. Both Hawaiian and English are spoken on Oahu. 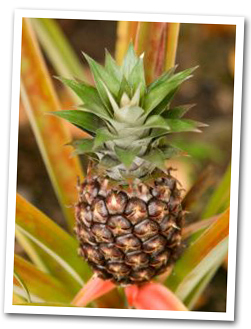 Studying a fun language guide will allow you to learn a few helpful Hawaiian phrases.